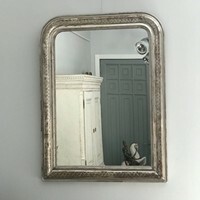 A stunning 18th century French Baroque silver gilt carved wood wall mirror. All in its original superb condition. The inner mirror plate together with the outer margins are all beautifully patinated. Phoenix is a beautiful shop, situated in the historic town of Royal Tunbridge Wells, in Kent. Peter & Robert have have worked within the antiques industry, for over thirty five years and joined forces to open Phoenix Antiques thirty years ago and in that time, they have built a thriving successful business. Initially specialising in original painted furniture, some pieces often being painstakingly hand scraped down to the very first period colour, a true labour of love! This passion naturally flowed into the love of the beautiful French fruitwoods, so often used in many of the carefully chosen pieces they now stock, together with many fabulous period mirrors, chandeliers, sconces, upholstered furniture and many more deliciously decorative things. They have a fabulous look and have built up a large discerning client base, both here in the U K and overseas. Please do look at the website here. TUESDAY - SATURDAY 10.00 a.m. to 5.00 p.m.